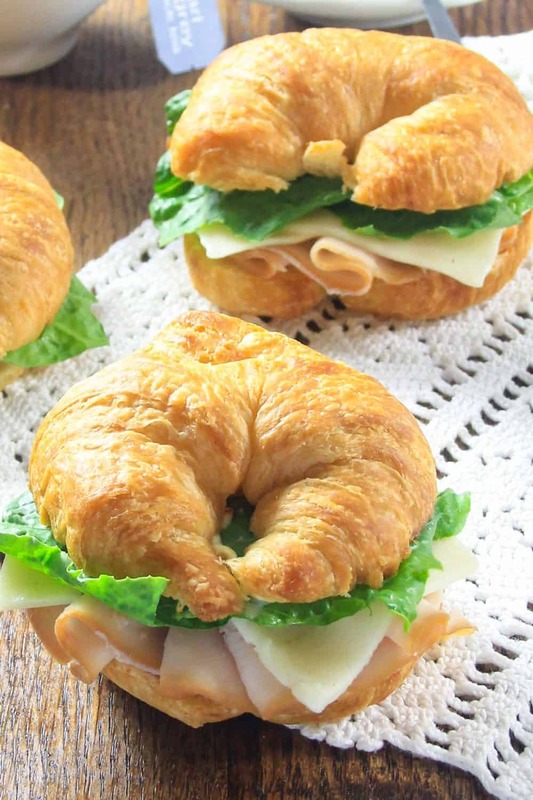 This turkey croissant sandwich is the perfect finger food for tea parties or casual get-togethers. With very basic ingredients, you might not even have to go to the grocery store for this recipe. Well, that’s if you always have croissants at home. Which we all do right? 😉 If you want to go above and beyond with this recipe, you can even make your own croissants from scratch! This recipe was originally posted on Sep 23, 2015, we’ve tweaked it a bit since then. This post may contain affiliate links. Read my disclosure policy here. This recipe makes 6 sandwiches – enough for the entire family. As they say, the secret is in the sauce! And I’m sharing that secret sauce with you. 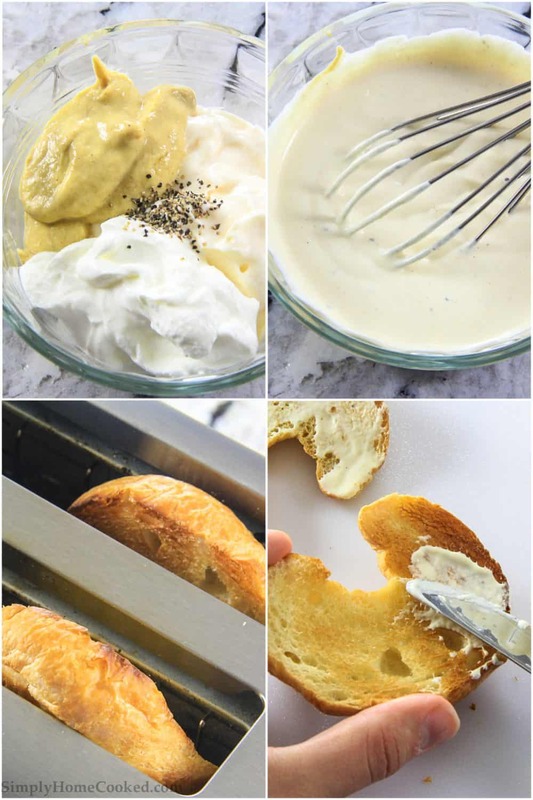 In a bowl whisk together mayonnaise, sour cream, Dijon, and black pepper, and set aside. Cut each croissant in half and toast in the toaster on low heat. If you want to save time, you can also just put all 6 croissants – sliced – in the oven and broil until toasted. Generously spread the Dijon mayonnaise on one half of the croissant, add 3 slices of turkey breast, half slice of Havarti cheese, and a small piece of romaine lettuce. Then top with the other half of the croissant. What can you substitute for Havarti cheese? If you can’t find Havarti cheese in the grocery store you can substitute it with Muenster cheese. They have the same flavor profile and both pair perfectly with my sauce. Can the sauce be used for other things? Yes, it definitely can! I always make extra mayonnaise because it can easily be used for other recipes or different types of sandwiches. 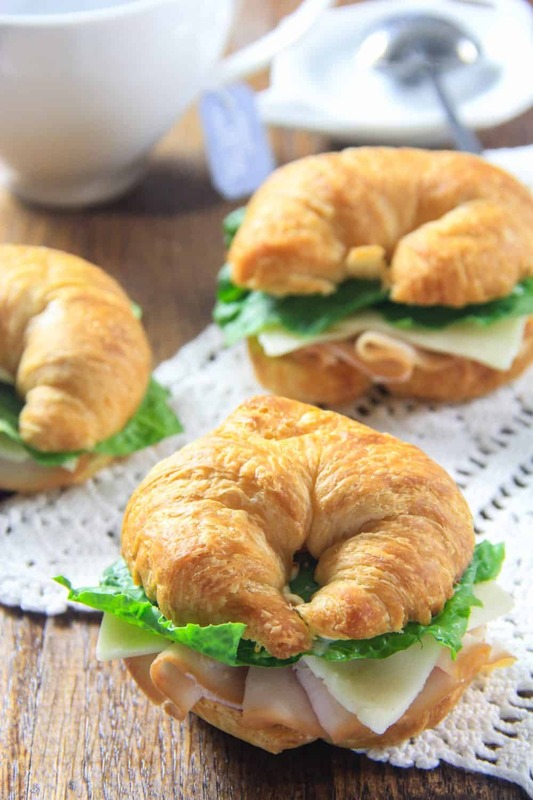 This turkey croissant sandwich is the perfect finger food for tea parties or casual get-togethers. Easy to make recipe with very basic ingredients. Cut each croissant in half and toast in the toaster on low heat. If you can't find Havarti cheese in the grocery store you can substitute it with Muenster cheese. I made these last time for a party, the best sandwiches i have ever made. I am making them again today for another party. One tip would be to get everything at Costco. That is what i did this time, much cheaper if you are making a large amount. I am making for 30 people today. Last time i made them, everyone raved how good they were. Thank you for taking the time to write such amazing feedback Jonathan! Glad the sandwiches were a hit! Love croissants! Have always been using straight mayo; next time I will try this spread! Thank you!